Contrary to a popular belief amongst the politicians that Europe ends in Germany, it is in fact the Ural mountains that separate Europe and Asia. The Urals are a nearly linear range about 3000 km long and 100-400 km wide that extends from the Arctic to Kazakhstan. Over this vast expanse five segments are distinguished: the Polar and Cis-Polar Urals; the northern, middle, and southern Urals; and the Kazakh Urals including the Mugodzhars (Figure 13.2). In the north, the folded structures disappear underneath the Barents Sea and in the south under the sediments of the Tarim Plate. In terms of its tectonics and geology, the Urals are divided into a series of longitudinal megazones which have developed along the modern eastern margin of the East European plain (see Figure 1.7). The western zones are traced along the entire length of the mountains while the eastern zones disappear under the Mesozoic-Cenozoic sediments of the West Siberian platform north of the middle Urals and the eastern margin is marked by the prominent horsts in which the crystalline basement has been uplifted. In terms of orography, the Ural mountains consist of a few parallel ridges with low to medium heights. The highest summit, Mount Narodnaya in the Cis-Polar Urals, reaches 1894 m.
This section concentrates on four aspects of the Urals geography: orogeny, the Quaternary history, contemporary climate, and vegetation. But equally important is a long history of human transformation of its natural environment. Settled in the late 16th century, the Urals are one of the oldest industrial regions in Russia whose development began under the reign of Peter the Great in the 18th century. It quickly became the greatest centre of heavy industry in the Russian Empire, specializing in the production of iron and copper. Marginalized throughout the 19th century by the growing coal and metal-producing areas in southern European Russia and the Ukraine, the Urals were redeveloped in the 1930s in the course of a massive transfer of heavy industry to the east. The major national metalworks were established in the cities of Magnitogorsk, Yekaterinburg (then Sverdlovsk), Chelyabinsk, and Perm. Positioned away from the borders, the Urals accommodates major nuclear research and development centres and have been a site for the world's most severe nuclear accidents. These issues are discussed below. The Ural mountains are the oldest and the richest mining region in Russia and their structure and geology have been a subject of research for many years. A brief historical account of the evolution of ideas, which reflects the general development of tectonic concepts, is provided by Puchkov (1997). Until the 1970s, the Urals were regarded as an exemplary geosyncline while with the development of ideas on plate tectonics it was proposed that the Urals represent a closed Paleozoic ocean (Hamilton, 1970; Ivanovetal, 1975; Peiveet al., 1977; Zonenshain et al., 1984). 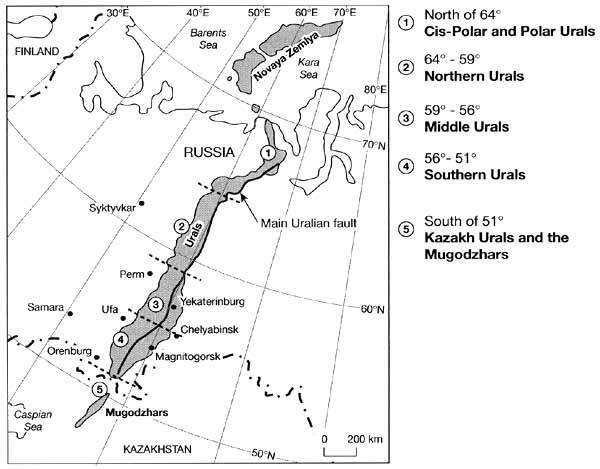 Subsequently, the formation of the Urals was viewed as a plate tectonic framework and this is now well established (Zonenshain et al, 1990; Puchkov, 1993, 1997). The Urals were formed by the collision between the East European platform and the Siberian Plate and related microblocks and volcanic arcs in the late Paleozoic which lasted for approximately 90 million years (Ma) (Table 13.1). The continental western part of the Urals and the island arc complexes in the east are separated by the Main Uralian fault which forms a continental-scale lithospheric boundary and a major topographic divide (Figure 13.2). The western Urals consist mainly of the folded sedimentary strata of the East European platform while the eastern flank consists of volcanic and deep-sea deposits. The latter have been thrust westwards creating a well-pronounced asymmetry between the gentle western and steep eastern macro-slopes. Together with the Appalachian, Caledonian, and Variscan orogens, the Urals were one of the major zones of continental convergence that contributed to the formation of the Pangaean supercontinent. However, in contrast to other mountains of this age, the Urals were not significantly remobilized after the Jurassic and remain the best preseved example of the collisional Paleozoic orogeny. The post-Paleozoic development of the Urals, reviewed by Puchkov (1997), included three major stages. Tectonic activity took place in the middle Jurassic when fold and thrust deformation, which was most intense in the north, led to the formation of the Pay-Khoy — Novaya Zemlya fold belt which did not exist earlier. This resulted from the direct convergence between the East European and Siberian continents, which being integral parts of Pangaea, could still change their relative positions. During a long tectonic pause between the end of the Jurassic and late Paleogene, the Urals were eroded, turned into low hills, and partially a lowland ingressed by the sea. In the late Oligocene the mountains started to grow again, the process which is still continuing, resulting probably from the intracontinental deformation. During the Quaternary, the northern part of the Urals was repeatedly glaciated. The ice sheet glacia-tion developed in the region in the early and middle Pleistocene, although from the available evidence it is impossible to establish whether the glacial centre was located in the Urals in the early Pleistocene. In the late Pleistocene, the mountains of the Polar Urals served as a barrier to the ice advancing from the Arctic, dividing it into two lobes. In contrast to the more extensive middle Pleistocene glaciation, the late Pleistocene (Valday) glaciation, in which two stages are distinguished, was restricted to the polar areas (Chetvertichnaya sistema, 1984). During the early Valday, the ice advancing from the Arctic shelf along the Urals exhibited an asymmetrical distribution: while on the western flank it reached 65°N, on the eastern flank it only reached the Arctic Circle (Krapivner, 1976). The montane glaciers descended both westwards and eastwards on to the adjacent lowlands, forming piedmont glaciers. Their terminal moraines occur in the east between the Arctic Circle and 66°N while in the west the occurrence of transverse moraines indicates that glaciers were blocked by the south-flowing ice (Astakhov and Yakimovich, 1993; Astakhov, 1997). A piedmont glacier apparently existed in the western Urals at 64°30'N (south of the Arctic ice extent) while individual valley glaciers reaching the foothills developed to 63°N. In the east, glaciers were restricted to the mountains north of 65°N. Traces of cirque and small-scale valley glaciation are found as far south as the southern Urals (Lider, 1976). During the late Valday, glaciation was mainly of the alpine type as a result of the increasing aridity. The Arctic ice sheet affected only the northernmost part of the mountains, reaching about 500 m in thickness around the tip of the Polar Urals and helping to form the fjord-like valleys which are a typical feature of this landscape. The ice did not extend into the foothills south of 66-67°N while between 66°N and 63°N glaciers developed only above approximately 1000 m (Astakhov and Yakimovich, 1993; Astakhov, 1997). 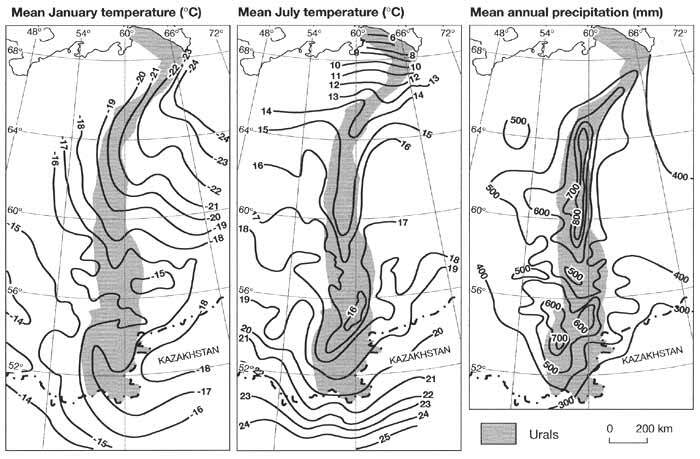 There was a notable lack of glaciation in the northern and middle Urals in contradiction to a popular opinion that the Urals effectively intercept moisture transported by the westerly flow. Rather, shielding from the strong westerly winds provided conditions for the formation of cirque, snow, and ftrn (neve) glaciers and a more widespread development of woody vegetation on the eastern flank. During the late Valday, a widespread development of permafrost occurred in the periglacial zone. The vegetation of the unglaciated Urals had an open nature and cryoarid communities dominated. Picea forests, typical of the Mikulino interglacial, disappeared almost completely, surviving only in the deep river valleys. 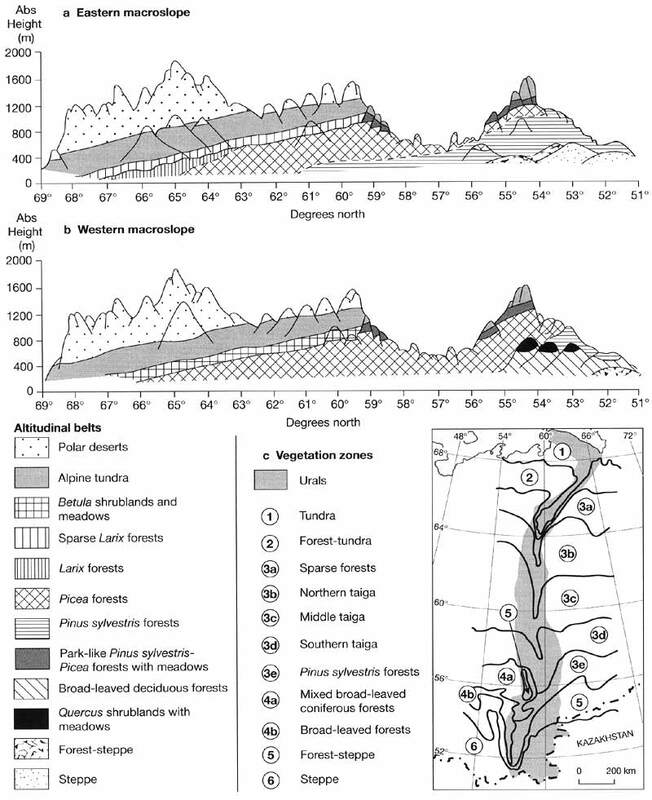 The distribution of vegetation was characterized by both latitudinal and altitudinal zonality. Thus, according to Astakhov and Yakimovich (1993), in the piedmont plains and foothills the tundra-steppe communities dominated between 63°N and 58°N with the tundra and forest-tundra vegetation developing in river valleys. Further south, between 50°N and 58°N, the dry steppes dominated with forests growing in riparian habitats. The lichen arctic tundra and interzonal woody vegetation in valleys developed between 300 m and 600-700 m. The polar deserts dominated above 300 m in the northern Urals and above 600-700 m in the southern Urals, while the high mountains were barren. Deglaciation followed the amelioration of climate at 12-11 Ka BP. The cooling of the Younger Dryas resulted in the advance of alpine glaciers in the Polar Urals (Gesse et al., 1963). A warmer climate which developed between 9-8 and 2.5 Ka BP, when summer temperatures were 2-2.5°C higher than now, caused their widespread degradation (Surova et al., 1975). After the climatic optimum, conditions once again became cooler by 1-1.5°C. Yet another glacial advance occurred and most ancient cirques in the Polar and Cis-Polar Urals were filled with ice (Troitsky et al., 1966; Serebryanny and Solomina, 1996). A study of dendrochronology in the Polar Urals provided detailed information on summer temperatures since the 8th century (Shiyatov, 1995; BriffaetflJ., 1995;Vaganov et al., 1996; Solomina, 1999). Temperatures were higher between the 11th and the 13th centuries, when the altitudinal tree line was positioned 60-80 m above its present level. The reduced growth of alpine forests and lowering of the tree line associated with climatic cooling began in the 14th century and continued until the beginning of the 20th century. The 16th and the 17th centuries were the coldest, with summer temperatures at about 2°C lower than at present and lichenometric dating of moraines has confirmed the renewed growth of glaciers (Serebryanny and Solomina, 1996; Solomina, 1999). The 20th century was the warmest on dendrochronological record. However, woody vegetation has not yet spread to the habitats which it occupied during the medieval climatic optimum (Vaganov et al., 1996). Contemporary glaciation is restricted to the Polar Urals and reviewed above. Extending from the Arctic Ocean to the Caspian Sea, the Ural mountains cut across almost the full spectrum of latitudinal zones and exhibit a great variety of climatic conditions. The incoming solar radiation changes from 75 kcal cm2 in the north to 110 kcal cm2 in the south which predetermines a great difference in summer climates (Figure 13.3). Different circulation processes affect the northern, central, and southern regions. Whereas the north and the central regions are under the influence of depressions developing on the Arctic and Polar fronts respectively, the southern Urals are dominated by anti-cyclonic weather. Depressions occur north of 61° latitude on average for 240 days per year, being particularly frequent (over 20 days per month) between October and April. A reverse pattern is observed south of 56° where anticyclonic circulation dominates on 260 days per year, exceeding 20 days per month between October and April when the Siberian anticyclone develops (Kuvshinova, 1968). The southern and Kazakh Urals are characterized by the greatest continentality of climate, dry and hot summers and cold, dry winters with frequent temperature inversions. The absence of a thick snow cover means deep freezing of soils, while the low density of snow predetermines the frequent occurrence of blizzards and snowstorms which develop even under the relatively low wind speeds. The Urals do not create a marked difference in the amount of precipitation received by the east of the European territory and Western Siberia. On the contrary, orographic forcing is an important factor in the development of deep depressions in the lee of the Ural mountains over the West Siberian plain (Chen and Zhang, 1996). However, annual precipitation totals on the western slopes of the Urals itself exceed those on the eastern slopes by 100-150 mm (Figure 13.3). The difference is best expressed in winter when precipitation is produced by low pressure systems travelling in the westerlies. Precipitation enhancement on the western macroslope and the development of a rainshadow are evident from the distribution of snow cover along 64° latitude: snow depth in the Pechora lowland is about 90 cm; it increases to 120-130 cm in the western foothills, reaching about 150 cm on the western slope in high mountains; on the eastern slope snow depth declines to about 60 cm (Kuvshinova, 1968). Montane analogues of most botanical latitudinal zones are represented in the Urals. These are displaced southwards in comparison with the surrounding plains in response to the altitudinal temperature decline and precipitation increase (Figure 13.4). Thus while on the surrounding plains a characteristic latitudinal succession of the taiga subzones occurs, in the mountains the dark northern taiga communities dominate as far as 60°N. Different amounts of moisture received by the western and eastern slopes predetermine an asymmetrical vegetation distribution particularly in the most elevated Polar, northern, and southern Urals (Figure 13.4 a, b). Thus forests composed of moisture-demanding species, such as Picea obovata, with the participation of Abies sibirica and Pinus sibirica dominate on the western macroslope and watersheds of the northern, middle, and partly southern Urals while on the drier eastern macroslope Pinus sylvestris and Larix forests are widespread. In the southern Urals, the climax communities of the western macroslope are represented by broad-leaved forests composed mainly of Quercus, Tilia, and Acer while at the same latitudes and altitudes steppes dominate on the eastern flank. The southern Urals serve as a well-defined longitudinal boundary between the European broad-leaved and mixed broad-leaved coniferous forests and the Siberian pine and alder-birch formations. The broad-leaved forests have been vastly transformed by human activities and in the foothills primary forests have been mostly replaced by agricultural lands, meadows, and small-leaved secondary forests. The northern and central Urals are among the main timber-producing regions of Russia. Issues of forest use and management in the taiga regions of the Urals are discussed below.